There’s this amazing hummus and falafel shop that is off of the highway on the way back to campus from Amman that I stop at almost every time I am coming back around dinner time, and it happens to be right next to the “Biggly Wiggly” convenience store (from which I obtained the bag above). It seems like this would be perhaps a rip off of “Piggly Wiggly”, the grocery store hailing from South Carolina, which is somewhat likely because there is a lack of distinction between the letters “p” and “b” in Arabic… but maybe that’s not what happened becuase the logo seems to be a rip off of the Vlasic pickle bird dude. And there is certainly a distinction between pigs and birds over here (you don’t eat one, and you eat the other with basically every meal). 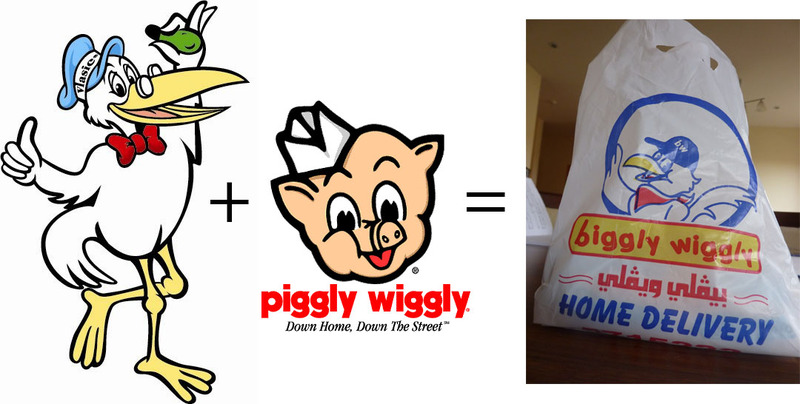 But maybe, since pigs are unclean, they would make a bad logo for a convenience store, so they changed it to a pickle bird (but just had to have that iggly-icious name)? Or maybe they thought that by violating two copyrights (if that concept existed here) at the same time it would be some sort of Double Jeopardy loophole and they would get off scot free? Posted on May 23, 2010, in Jordan, Living Abroad, Random. Bookmark the permalink. 2 Comments. “I just howl for the fowl”? That’s honestly the best I could do.